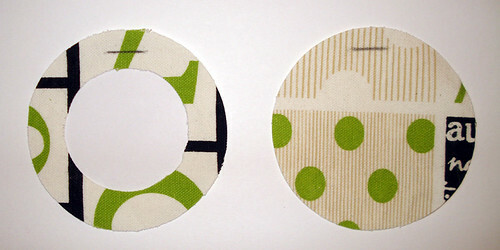 Want a quick little round project? Why not a luggage tag? If you’re like me, all my luggage looks just like everyone else’s on the luggage carousel. 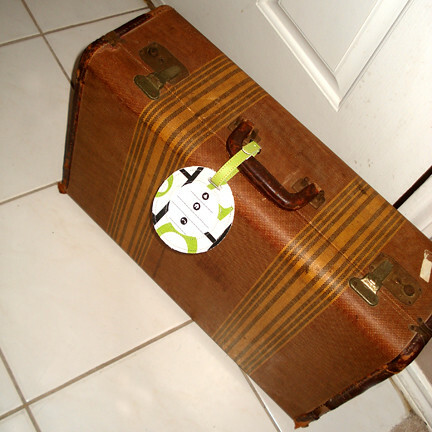 What my suitcases need is a little something to set them apart so I can spot them from far away. Note: the luggage above is not what I actually carry on trips. This one is strictly for display purposes only – cute, but also old and fragile. 5. luggage tag strap (buy ’em or use one from an old luggage tag). 1. The fabric I used in the following pictures is NOT interfaced, but it should have been. Interfacing adds sturdiness and minimizes fraying of the raw edges. 2. 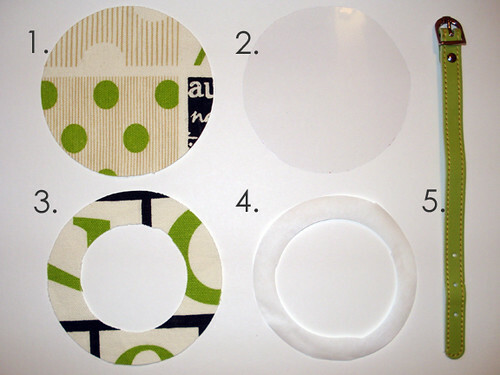 Throughout this tutorial, I will be calling the clear plastic “vinyl”, but it really is cut from a clear plastic presentation cover sheet (available at office supply stores). 3. 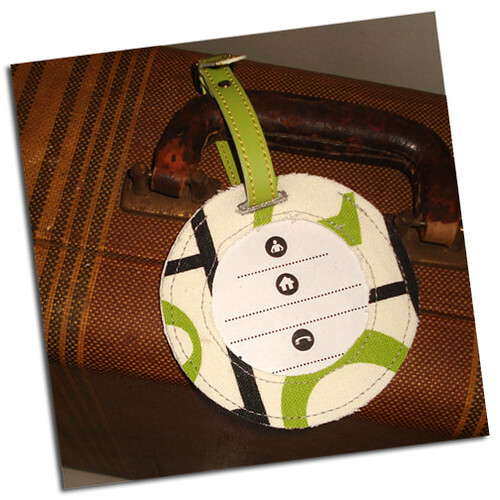 Pattern pieces are in a pdf file here: Round Luggage Tag Pattern Sheet. Make sure page scaling is set to “NONE”. 4. There are plenty of options when it coves to luggage tag straps. There are the buckled kind shown above as well as plastic loops. STEP 1: Start off by fusing the fusible webbing to the WRONG side of the fabric ring. Peel off the paper backing. STEP 2: Center the fabric ring over the vinyl so that the vinyl is against the WRONG side of the fabric. Carefully press the FABRIC ONLY to warm up the webbing so that it sticks to the vinyl. Be careful not to keep your iron in one place too long as you may melt the vinyl. I had the setting of my iron on “cotton” which is quite hot and didn’t have a problem. 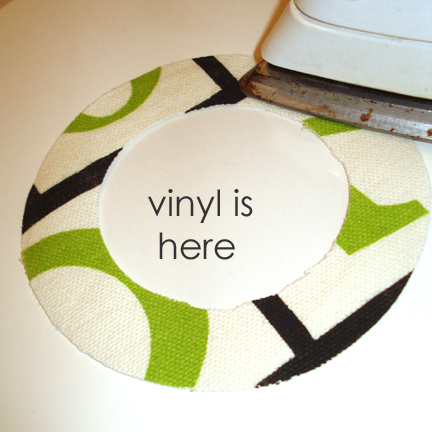 Fusing the vinyl to the fabric prevents it from sliding around in the next step. The vinyl is impossible to see in the picture, but it really is there. STEP 3: Mark identical marks on both pieces of fabric, 3/8″ from the edge and 3/4″ wide. Stitch buttonholes around these lines. With a seam ripper, make an opening in the buttonholes. 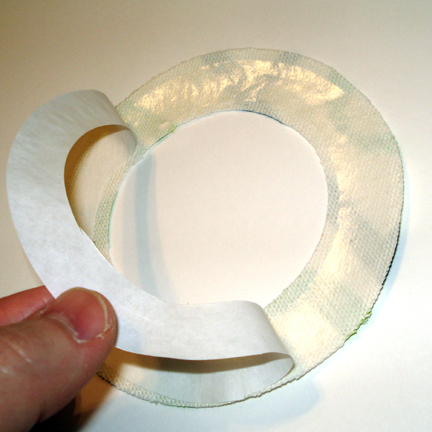 STEP 4: Stitch around the inside of the ring with a 1/8″ seam allowance, securing the vinyl to the fabric. Hey, no laughing at my sorry stitching here. STEP 5: With both pieces WRONG sides together, slip the strap through the holes to keep them lined up properly during this final step. Starting ~1 from the buttonhole, stitch the rings together, using a 1/4″ seam allowance. Stop stitching ~1″ before reaching the buttonhole. Don’t forget to backstitch at the beginning and end. 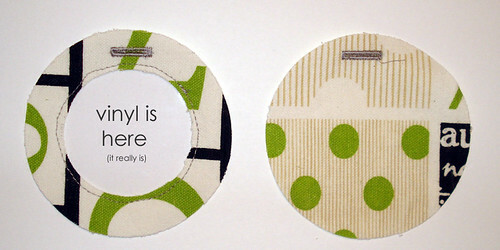 This little paper insert is available on the pattern sheet here: Round Luggage Tag Pattern Sheet. This little circle makes me happy and I hope it makes you happy too! I’ve been eyeing some new tags lately because ours are falling apart (and plain, ugly black ones), but just couldn’t part with the money. These are perfect! And so much cuter!! So glad you like them! I think they would make a perfect honeymoon gift. 🙂 I’ve gotta to find a place that sells the cute leather straps. I love the green, but haven’t seen many colors other than brown for sale out there. That’s really adorable! I love the idea of your circles month, but I am so pitiful at curves…. I sorta am bad at curves, too, but have learned something in the past couple of years that has helped. I’ll try to post about it soon. very nice. i’d love to carry a line of your luggage tags in my store. p.s. i have my doubts about whether the vinyl is really there. Fred, are you calling me a liar?? Ha! Fun! I love your new suitcase! Can’t wait to see it in action. Just a few more weeks, then it will be displaying some lovely patterns. Hopefully the musty smell will be gone by then! You can’t scare me with circles AND vinyl, then tell me that Target has some cute tags for cheap. At this rate I’ll never attempt to sew a circle. Don’t worry, I won’t be rushing out to buy the sweatshop’s wares just yet – I doubt that I’ll be hopping on an aeroplane any time soon, unless I win the lottery. Aww, this is so cute! 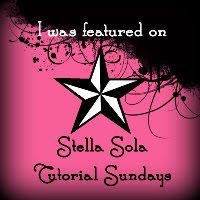 Thanks so much for the great tutorial, I’ll be linking. My cousin is moving to London for a year & these are perfect as a going away gift! Thank you for these circular lessons! I didn’t know that you can get circular sewing feet for sewing machines, I now really want one! Love! Love! Love! I’ve been attaching knitted i-cord bows to my luggage and they don’t travel well at all. I think I need some ultra-cool luggage tags! Wow! That is exactly what I’m after making!!!! !